You can create or join a new game and learn by playing! If you have any questions, post something on the forum, or ask for help in the chatroom. The easiest way to get started is to have a look at the flash tutorial here (900 kB). The game is about dogfights between space fighters in deep space in the far future. Each player can build his/her own customised fighter, choosing its armament, engines, and thrusters. The aim of the game is to shoot down as many enemy fighters as possible... without getting shot down yourself! You are not alone in the space: in each game the players are gathered together in teams, and learning team play and coordination is essential to stay alive. Go here to create or join your first game: you will be taken to the fighter construction page! Each game is created with either simple, standard or advanced rules. To start playing a simple game, you just need to know the simple rules. When you feel more confident, you can come back and read the standard and advanced rules. Fightes move Each fighter moves in a certain direction by a certain number of hexes determined by its speed and thrust. Fighters shoot Each fighter shoots to the nearest enemy within a 60 degrees arc forward. Fighters retire Fighters out of the game field and with a speed pointing out of the border retire. The movement rules reflect how movement in deep space really works. 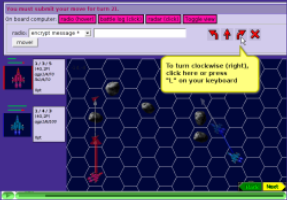 Have you ever played Asteroids, the computer game? These rules are very similar to the movement rules of that game. This is the technical explanation, it's also useful to have a look at the simple tutorial. Your fighter's position and movement on the board are marked by the picture of a fighter and by two triangles. Old position. This is the fighter's old position, during the previous round. The fighter's weapons point in the direction of the fighter's nose. Somewhere near your fighter you will see two coloured triangles: suppose this is round 10: the two triangles mark your fighter's positions at the beginning of round 11 and round 12. Final position. The first, coloured triangle marks your final position and facing. This is your fighter's position and facing at the end of the current round. Following round's position. There is a second coloured triangle on the board, a bit further away from your fighter. This second triangle marks where you will end up after two rounds! Your position after two rounds, in fact, is affected by your movement during this round and during the following round too! Speed (default move). Each fighter has, at the beginning of each round, a certain speed, which is marked by a coloured arrow. This speed is your fighter's default move: if you don't use your thrusters, your fighter will move along this arrow to the marked hex. But if you use your thrusters, you can change your fighter's trajectory. Notice that, since in deep space there is no air, a space fighter can move in a direction and face in another direction (something aircrafts cannot do!). Actual movement. By using your thrusters, you can instead move along a different direction, which is marked by a solid grey arrow which connects you current position to your final position. Final speed (following turn's default move) A dashed grey arrow is attached to the solid grey one: it indicates what your speed will be at the end of this round. That is, it will become the following round's coloured arrow: the following turn's default move. During the first round (and sometimes in later rounds) your speed will be zero, which means that your fighter won't move unless you turn on your thrusters. This is marked by a circle around the fighter. Your fighter is equipped with thrusters, which make you accelerate forward, and with spinners, which make you change facing. At the beginning of the game, each player is given a certain number of movement chits, which can be used to move the fighter. There are two types of chits: forward chits and spin chits. The final position of your fighter (the first triangle) will move forward 1 hex. 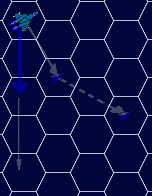 The following round position of your fighter (the second triangle) will move forward 3 hexes, because the fighter will pick up speed. The position of your fighter on turn 11 will move forward 1 hex. The position of your fighter on turn 12 will move forward 3 hexes. This is not definitive: you can change the position a bit more during the following turn. These are the two sides of a spin chit, which is used to change your fighter's facing. If you play one side of the chit, the fighter will move clockwise; if you play the other side of the chit, the fighter will move counterclockwise. Your fighter's velocity and position are unaffected by the spinners. You will usually have between 4 and 7 of these chits available. Your fighter's manoeuvrability: during each round, you can only use a certain number of movement chits (forward or spin), typically 4 to 7. This is called the fighter's thrust. On the movement interface, you will see a certain number of empty slots, where you will place your movement chits. This number of slots is the fighter's thrust. Your pilot's resistance: the fighter's thrusters are very powerful, but a pilot cannot accelerate too much, or she/he/it will be killed by the acceleration. For this reason, you only have a limited number of forward chits, and you cannot use more than these. The number of forward chits that you have at your disposal is called the pilots's g-max factor on the fighter's sheet. You will have as many spin chits as your fighter's thrust (that is, you can use as many spin chits as you want, up to your fighter's thrust). Fuel: depending on the type of fighter, you either spend 1 "pulse point" for each chit that you use, or 1 "round of fuel" every time you spend at least one movement chit in any given round. For example, if your fighter gives you 3 forward chits and 5 spin chits, and has a total movement allowance of 5 slots, you could play 1 forward chit and 4 spin chits, or all 3 forward chits and just 2 spin chits. In this second case, the fighter thrusts immediately twice forward, then spins on the left one hex-side, and then thrusts forward again once. The final facing is the same, but the final positions are different. The first case is shown in the following figure, one step at a time. The asteroids will be explained later. This is a valid move: the fighter spins left one hex-side, and then thrusts forward three times. The effect is the same as the one shown in the figure above, but this solution requires one more unit of the fighter's thrust with respect to the previous example. Or, more precisely, propellent. Depending on your fighter, your automomy will be turns-based or pulses-based. If your fighter sheet says something like "fuel: 125/327 pulses" this means that you have 125 units of fuel to expend. You spend one unit of fuel for every chit that you play. If your fighter sheet says, for example, "fuel: 25/67 rounds" you have 25 rounds of autonomy left. You can save fuel by not using any chits (at all!) in a given round, that is: no spins and no forward moves! If you have already built up some speed, and do not use your thrusters, you will spend no fuel! Life's like that in space... Fighters will start the battle with less fuel than their full autonomy. This is meant to simulate fuel expenditure to reach the battle field. Have a look at the simple tutorial! Your fighter's real movement is marked by the arrow connecting the fighter to the first triangle: if this crosses an asteroid, the fighter will crash against it, receiving damage. This is a very important point: your trajectory is indicated by this arrow: if your trajectory crosses an asteroid, you will collide. If your trajectory does not cross any asteroids, you won't collide. If you go straight through the centre of a hex containing an asteroid, you get 200 damage (less shields). If you pass near the centre, you receive less damage. It is important to understand that for collision purposes it is uniquely the solid grey arrow which matters. In the above picture, the first and second trajectories are not safe: you will collide if you submit one of these orders. But if you submit the third trajectory, you will not collide: forget the "intermediate" trajectories: it is only the final one that matters! This is because it is assumed that your fighter will apply all the thrust before making its movement, and then travel along the (single) chosen trajectory. If you go exactly along the edge on the "diagonal", you get no damage, but it still counts as a collision (one which causes zero damage): this means that such a "trajectory" wastes line of sight for firing. As you will learn by playing, fighters build up speed very easily, and it takes some time to bring them to a halt: you should plan ahead your moves, or your fighter will go too fast and you will find out that you can't avoid an asteroid! In this phase fighters shoot simultaneously. 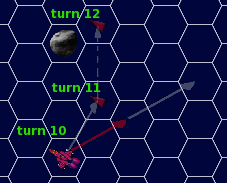 Each fighter can fire in a 60 degrees arc forward, as displayed in the figure. The maximum range depends on the weapon used, and is given by the first number in the weapon's name---for example, the reach of a qgp 6/100 is 6 hexes (the second number indicates the maximum damage the weapon can inflict). Weapons of type 0/8/150 also exist. These fire only in a straight line up to a distance of 8. For each weapon on the fighter sheet, the number before the slash indicates the maximum range at which the weapon can hit, and the number after the slash indicates the damage the weapon can deal at its "ideal" distance. OFC's and lasers are the main terran weapons. OFC's are the least accurate weapons, but they deal lots of damage at all distances; lasers are the most accurate weapons, but the damage dealt by them slowly decreases with distance. They are reasonably effective at all ranges. Alien fighters mostly mount QGP and LB guns. QGP guns are deadly at average to large distances. They deal an extra 100% damage to the shields. LB guns are even deadlier at very short distances, but they are ineffective at intermediate distances. They deal an extra 50% of damage to the shields. A table with the effectiveness of all the weapons is here. In addition to the weapon type and to the range, the attacker's chance of hitting is influenced by the quality of the helmet-mounted-sights, by the attacker's gunnery skill, by the defender's piloting skill, and by some leading-the-target modifiers. The helmet-mounted sights in the attacker's cockpit and the attacker's gunnery skill. Both of these are determined before the game starts. For each spin chit played by the attacker's fighter in the current round, a penalty to the to-hit probability and to the damage dealt is applied. For each forward chit played by the defender in the current round, a penalty to hit and/or to the damage is applied, depending on the defender's piloting skill. A table with all these modifications is here. Your base modifier is +4 columns (your skill). You are striking at distance 1, so your base chance is 90%, +4 columns =126%. If you roll 26 or less, you will deal double damage; otherwise you hit normally. Your enemy's modifier is +4 columns (his skill) -6 columns (he had to spin 3 times) -2 columns (you thrusted forward twice), total:-4 columns. His base chance is 90%, minus four columns: 54%. If he rolls 54 or less, he will strike you, otherwise he misses. QGP guns deal an extra 100% damage to the shields. LB guns deal an extra 50% damage to the shields. In addition, there is a probability equal to twice the damage delivered by each weapon to lose 1 thrust. For example, a 30-hits shot from an LB delivers 30 points of damage to the hull, 15 points of damage to the shields, and has a 60% probability of reducing a fighter's thrust by one. Between rounds, however, shields regenerate: 5% of the shields' original value is regained (damage which has been taken during the last round does not regenerate, of course). The map's boundaries are marked by coloured lines. If a fighter crosses these lines, and its final speed does not point toward the border, the fighter will retire or implode. You are allowed to retire only through your border, that is through the line of the same colour as your fighter. In the image below, the blue fighter has just been destroyed; if it were still operative, it wouldn't retire because its speed points towards the border. The green fighter, on the other hand, has a speed which points towards outer space: it will implode too, because it is exiting from the wrong border! However, since retiring occurs after shooting, it still got the chance to destroy the blue fighter! Exception: in the arena, if you cross the ring of asteroids (and survive), regardless of your speed direction, you will be destroyed. Your on board computer is equipped with a few vital instruments, which are activated simply by hovering with your cursor over them. Radio messages are part of the game. You are allowed to coordinate your tactics with your teammates (or taunt your enemies...) but only through the radio. Using other means of communication (e-mails for example) is severely frowned upon, as a proof of poor gameplay, cheating, and cowardice in battle. Notice, however, that each turn lasts about 2 seconds. Each pilot is subject to accelerations of about 10g's during the typical round, so she won't be able to say much. Your messages are limited to a fixed number of characters and, to simulate your wingmen's reaction times, will be heard when the round is completed. Exception: messages from characters having the leadership skill are heard immediately! This relates the last events: collisions with asteroids and firing phases. Active games: players who must move are in boldface. Eliminated players have their names struck through. Ended games: winners are in boldface. Losers have their names struck through. Submitting orders: if any players must still move, you are taken back to the games page. Otherwise, if you are the last player to move, the turn is run and you are taken back to the game's page to see what happened and submit your new orders. Use the toggler, or click on T on your keyboard, to change views. When previewing the next round, some smaller versions of other players' fighters appear: they indicate each fighter's speed, that is where it is drifting at the beginning of this round. An arrow points from the starting point to the end point of the fighter's movement. The true ending position can be modified by applying thrust to change the fighter's position before the shooting phase, but this will also modify the fighter's speed (see under the thrusters). 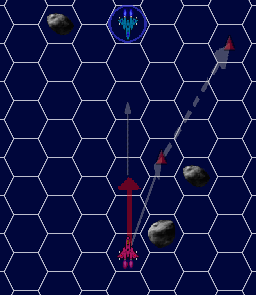 Two small triangles appear for each of the fighters you control: The bigger one indicates where your fighter will be at the end of this round, while the smaller one indicates your fighter's next round speed, that is, the place it will end up in the following round if you don't apply more thrust during the next round. This gives a cropped view of the battle board. Standard rules add three new game mechanics to the simple rules: dual thrusters, inertial grenades, missiles and rockets! Grenades and rockets are essentially one-use weapons. Missiles, on the other hand, are "intelligent" machines who are able to lock on an enemy fighter and chase him in the following rounds. Please refer to the tactics page for tactical tips and to the missile tutorial. Fightes move Each fighter moves in a certain direction by a certain number of hexes determined by its speed and thrust. Nothing changes with respect to the simple rules here. Missiles move Missiles attempt to hit the fighter they have locked on at the end of the previous round. Shoot Each fighter shoots to the nearest enemy within a 60 degrees arc forward, and unchains one of its missiles if the player wants so. At the same time, missiles, grenades and rockets deal damage to the fighters they strike. Missiles lock-on After the fighters and missiles have moved to the new positions, each missile locks on the nearest fighter within range and arc. The chosen victim is known at once to all players. Fighters retire, missiles self-destruct Fighters out of the game field and with a speed pointing out of the border retire. Missiles in the same situation self-destruct. This is identical to the simple rules one. 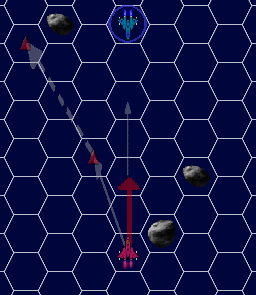 This time, however, if a missile has locked on your fighter, you will see a blinking crosshair on your final position. Missiles move just like the fighters, and have a thrust of 7. 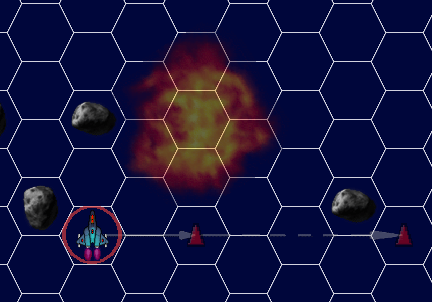 A missile goes berserk against the fighter it has locked on at the end of the previous round, disregarding obstacles in its way (like asteroids and other fighters). in the unlikely event that the target is directly behind the missile, it will spin right or left, randomly. Repeat the above procedure until the missile has expended all of its thrust or reached its target. Collisions: If during its movement the missile collides on an asteroid or on a fighter, it yields 100 damage (shields apply) to any fighter in the hex in which it explodes. 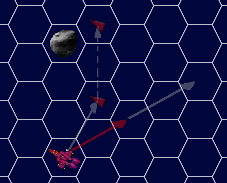 Missile moving along a diagonal: since missiles move like fighters, and since moving along a diagonal near an asteroid counts as a collision (albeit a zero-point one, see the simple rules), the missile explodes. If this is not clear, have a look at the missile tutorial! 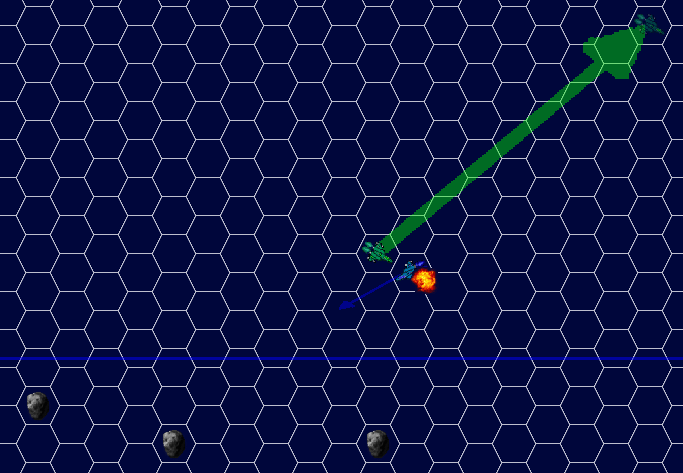 In this phase, missiles shot on the previous round deal damage, and fighters shoot, drop grenades, launch rockets and let go new missiles, simultaneously. In addition, any newly shot missile will explode at once if it is released in a hex containing one or more fighters (it deals 100 damage to all fighters in the hex), an asteroid (in this case, it is wasted), or a grenade/rocket cluster explosion. Newly fired missiles, and all missiles fired in the previous round which still haven't exploded, lock on to the nearest fighter, friend or enemy, within a forward 120 arc. 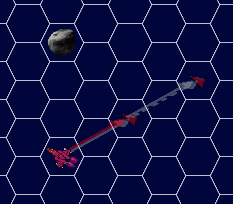 In the picture, only fighters in the violet hexes are within the missile's line-of-sight, because of the asteroids. When fighters are moving, missiles lock-on between rounds, on the fighters' initial position, and go berserk to the fighter's true final position. Lock-on is signalled by a blinking crosshair over the fighter the missile has locked on (not displayed in this figure). This phase is identical to the simple rules one, except that it applies also to missiles: they self-destruct. Some fighters mount dual thrusters, two sets of thrusters which allow to thrust 60° on the left or right instead of straight ahead. These fighters have no forward chits, but employ instead the double-sided chit shown here. The pictures below display the effects of a single thrust on the left or right. To activate these thrusters, press the U and O keys. The forward and boost keys I and K are disabled. You turn normally. HMS: For HMS, g-max and fuel purposes, one "side-thrust" equals one thrust. by spinning left, thrusting right twice, spinning right (cost: 4 thrust, 2 g, 2 turns). The first solution is preferred for alien pilots. Inertial grenades are one-use weapons, like missiles. If you decide to drop an inertial grenade, it will explode in your ''virtual position'', that is, in the hex where you will end up if you do not apply thrust. You cannot control the position where the inertial grenade will explode (the only way is to plan two rounds in advance, and boosts can be useful in this respect). An inertial grenade is the most devastating weapon available, yet it is extremely difficult to use, and it can be dangerous for yourself and your allies. 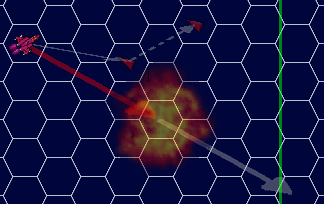 An inertial grenade will damage fighters and destroy missiles in its radius. A grenade with a radius of 2, for example, also affects all hexes adjacent to its explosion point. Friendly fighters are affected, of course, and so is your fighter: the image displays a fighter dropping an inertial grenade and avoiding its explosion area. 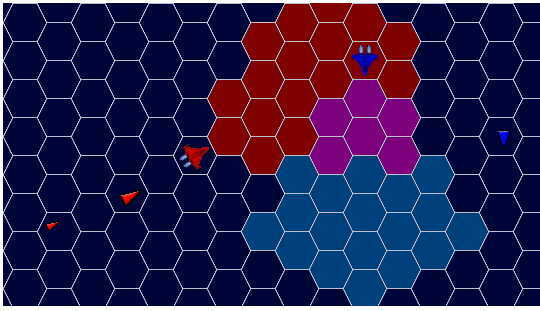 Only fighters and missiles finishing their movement in the affected hexes will be affected: fighters and missile crossing the area will not receive damage. Currently only range 2, damage 200 grenades are available. 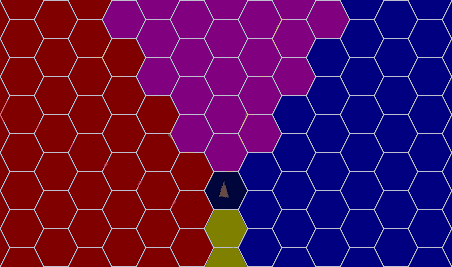 They inflict 200 damage in the central hex, and 141 damage in the external hexes. They affect an area analogous to that of a range 3, 60° arc weapon. Rocket clusters also destroy missiles in their area, and damage friendly fighters. Rocket clusters with different ranges/radii are on the todo list. Unlike normal weapons, the myriad rockets you launch are able to pass through asteroid hexes and damage fighters on the other side. If you've arrived here, why not read the tactics page! Advanced rules are the most heavily playtested. They can change a bit often. Changes are applied at once to all advanced rules games. Only join advanced games if you want to be a playtester (thanks! ), want to give suggestions (thanks!) and you don't mind if suddenly some rules change in the middle of the game (sorry!). When you join a game you will have more options for fighter creation. Boosts allow you to change your fighter's final speed without affecting your final position. One boost costs like one forward thrust (1 pulse, one gmax), and shifts your fighter's second triangle by one hex. The images show the effect of thrusting (left) and boosting (right). To boost, you need to press the I key. HMS: For HMS, g-max and fuel purposes, one boost equals one thrust. Missiles: The trajectories of newly-shot missiles are affected by boosts: the new missile will appear as if the fighter had made one additional thrust in the direction it is pointing.